“We specialize in the development, design and sale of manually operated general aviation aircraft hangar doors and similar sized large doors for various applications. No electrical power is needed. Yet our non-powered hangar doors are easy for people to open and close. Our doors are strong and safe! They are built like an airplane–strong yet no more weight than needed to do the job. Our doors are designed to handle wind loads, open or closed! We have many different designs to deal with different climatic or site-specific conditions for your area. Build a hangar that’s sure to suit your protective needs with innovative, non-powered hangar doors. At FoldTite Systems, Inc., we design, develop, and sell manually operated, general aircraft hangar doors and similar-sized large doors for various applications. Whether you’re designing your building for small aircraft storage or you’re developing a large-scale, commercial aircraft hanger, our doors are sure to serve you well. When you’re considering your aircraft hangar design, it’s important to ensure that your storage building offers ideal protection and is equally easy to use. Designed with strength and utility in mind, our custom, general aviation hangar doors are both strong and safe. Built to handle extensive winds either open or closed, our doors are fabricated to perform in various climatic or site-specific weather conditions. Count on us if you’re in the market for a great alternative to traditional electric-powered doorways. Beyond offering multiple door systems fit for different climatic conditions, we also offer custom door systems depending on our clients’ unique preferences and their existing hangar designs. From top-hung sliding doors for large buildings to bottom-rolling doors for large buildings, we’re prepared to create a sliding door system that meets your aesthetic and practical needs. Whatever you choose, you can rest assured that your new hangar door system will be built strong, just like the aircraft it’s protecting. With no electric power necessary, our doors can be moved smoothly by manual effort and stored on the building’s inside walls. As a result, you’ll find that your hangar doors are not only built strong, but they also offer optimal internal storage space. In addition to our inside slider door system, we also offer accordion, hinged, horizontal bi-fold, and combination systems. As a team of experienced aircraft enthusiasts, we know what it’s like to handle plans both in and around the hangar. Having a protective storage space to house your aircraft in at the end of the day offers immeasurable peace of mind. Trust our skilled specialists to help you design the right manual hangar door needed to fit your application. Call us with your requirements for custom, non-powered hanger doors and we’ll provide you with an economical solution and quote that’s sure to fit your needs. Contact us for more information regarding our custom hangar door fabrications. We proudly provide nationwide service from our locations in Mechanicville, New York and Chandler, Arizona. 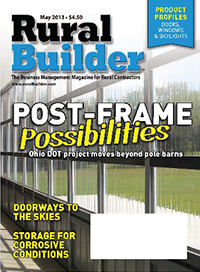 We have been featured in the May 2013 issue of Rural Builder. The article describes our business, describes the doors and features photos of installations of our doors. To read the article click on the photo of the magazine cover to the left. We apologize. This will be the first year since 1982 that we will not be at EAA Oshkosh as an individual or an exhibitor. Please contact use for any information by phone, email or through our web site.